Our dental health goals for your pet are to save teeth, and keep the mouth healthy and pain free, all of which improves the overall health of your pet. We provide routine dental care including ultrsonic scaling, polishing, digital dental x-rays, with extractions when needed. 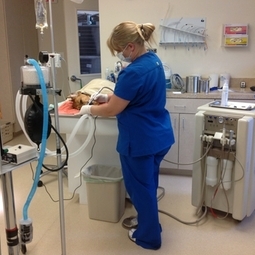 Our patients are carefully monitored while under anesthesia. Our doctors and staff have taken additional training in dental care and maintain continuing education in pet dental care. This is an out-patient procedure that has many health benefits.